The bill passed by the House stands to harm key constituencies of Maine's rural 2nd District, but Bruce Poliquin's core supporters favor an Obamacare replacement. Rep. Bruce Poliquin’s vote to help the American Health Care Act narrowly pass in the House Thursday is likely to have galvanized his opponents, but not eroded much support among voters who twice have elected the Republican to office from Maine’s 2nd Congressional District. That’s the assessment by political observers who also caution that bill is unlikely to pass the Senate in its current form and the ramifications of Poliquin’s support for the bill will depend largely on the legislation’s final fate. Poliquin long has said he opposed the Affordable Care Act, President Barack Obama’s signature 2010 legislation, but he dodged reporters’ questions about his position on the House Republican’s replacement plan and didn’t announce his support for the bill until a telephone interview a half-hour before Thursday’s vote. During the call, Poliquin sought to minimize the bill’s effect in his home state, incorrectly saying that it would affect only 7 percent of Mainers. He repeated the same point multiple times about the small percentage of Mainers who would be affected — the roughly 80,000 people in the state who have insurance under the ACA. But the claim isn’t true, because the House bill includes cuts to some Medicaid programs for low-income people, and Maine had about 270,000 people enrolled in the program, known as MaineCare; and there’s also a provision in the bill that would allow states to let insurers charge more for customers with pre-existing medical conditions. Even so, Poliquin might have faced a greater political risk had he not voted for the Republican health bill, Melcher said. Health care advocates say the AHCA could strip health insurance from millions of people, cause skyrocketing premiums for older people in rural areas and slash Medicaid, among other changes. Hospitals in the rural 2nd District — already facing budget holes and staff cuts – may endure increased expenses if people seeking care can’t pay for services. Steven Michaud, president of the Maine Hospital Association, said the group opposes the House bill because it threatens an “already fragile safety net” in rural Maine, where hospitals are closing departments and scaling back services. The group fears that if hospitals have to treat higher numbers of uninsured people, that drives up insurance rates for those with private insurance, because hospitals are legally required to treat everyone regardless of ability to pay. That’s of particular significance in Maine’s mostly rural 2nd District, where the economy has been hit hard with recent mill closures, cuts to hospital staffs and the opioid drug crisis. Poliquin’s 2nd District predecessor, Democrat Mike Michaud, didn’t pay a political price for his eventual support of Affordable Care Act. In November 2009, the House narrowly approved the sweeping overhaul of the nation’s health care system and Michaud was among the final holdouts who gave the legislation a crucial vote of support following a meeting with Obama. The following year – even after widespread conservative backlash against the law that gave rise to the Tea Party movement and swept Republicans into control of the House – Michaud easily won re-election to a fifth term and was re-elected again in 2012. Poliquin beat Democrat Emily Cain in the 2016 race to win a second term by a comfortable margin, 55 percent to 45 percent, after the costliest U.S. House race in Maine history. In addition, Trump won the 2nd District majority vote, splitting the state’s four electoral votes for the first time in Maine history. 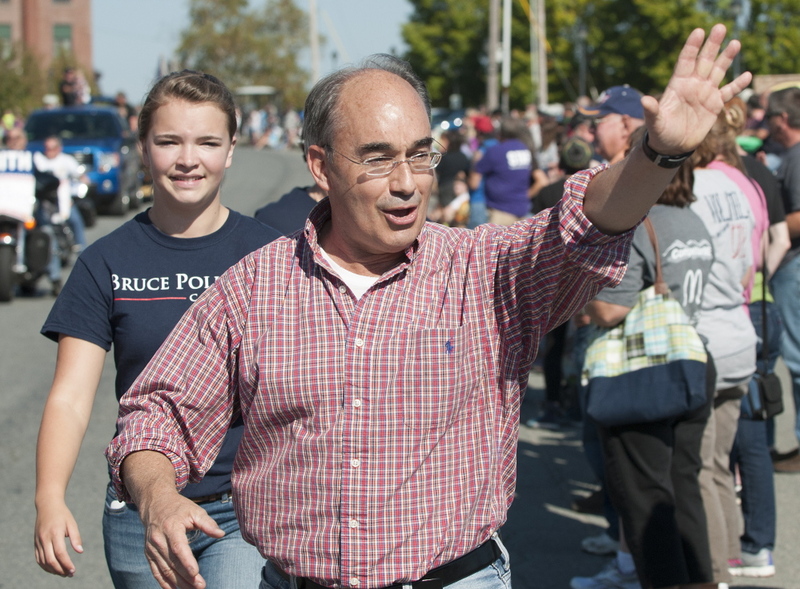 Poliquin’s penchant, though, for holding scripted appearances with business owners and officials where he refuses to talk about non-event matters – instead of open town hall meetings on a range of topics as other members of Congress have done – has fed a perception that the congressman isn’t forthcoming on issues, said Brewer, the UMaine professor. Ellen Grunblatt, 66, of Jay, a retired physician, was among a liberal-leaning group from Franklin County that attempted throughout March and April to get Poliquin to attend a town hall-style meeting to talk about issues. The group ultimately held the meeting without Poliquin on April 17 at the University of Maine at Farmington, drawing about 50 people. She doesn’t expect he’ll hold any town halls in the aftermath of the health bill vote. Kennebec Journal Staff Writer Colin Ellis contributed to this report.